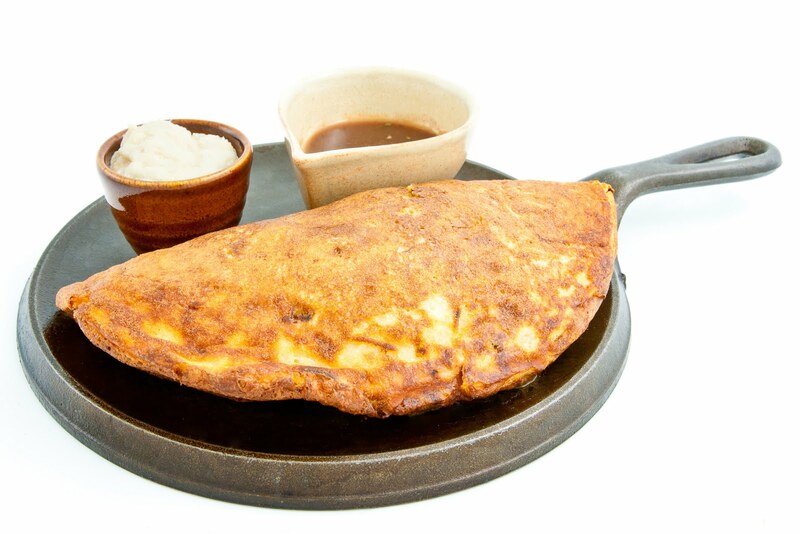 A large pancake made with potatoes and buttermilk, filled with braised local Irish beef and our famous Irish guinness it doesn't get better than that. A good homemade Boxty still fills me with joy, especially on a wet day (like most in Ireland). Boxty in the griddle, Boxty in the pan, if you can't make a Boxty, you'll never get a man. Take 4 of the potatoes and place in a pan, cover with water and place over a high heat. Bring to the boil, turn to a simmer and continue to simmer until the potatoes are soft enough to mash. Drain and allow to sit in the sieve until all the potatoes are very dry. Mash the potatoes through a mouli make sure there are no lumps. Take the other 4 potatoes and grate on the large side of a cheese grater. Place the grated potato onto a clean tea towel and squeeze all of the moisture from the potatoes, twist the tea towel quite hard to make sure you remove as much moisture as possible. Combine all ingredients and mix well making sure there are no big lumps. Season with salt and pepper to taste. Place a large none stick frying pan over medium heat and add a knob of butter. When the butter starts to foam, add a ladle of batter, enough to cover the base of the pan and approx ½cm deep. Cover over a gently heat until the base has set and is a golden brown colour. Flip the Boxty over and continue to cook on the other side until golden brown and the Boxty has been cooked through approx 5min. Place the flour and meat into a polythene bag and shake to coat the meat. Heat half of the butter in a deep casserole and fry the meat until golden and crusty all over. Remove the meat and set aside. Add the remaining butter to the same pan and fry the bacon until crispy. Add the onions, thyme and bay leaves and cook until the onion has softened. Add the remaining flour and stir to combine. Pour in the Guinness and stir vigorously, scraping the bottom of the casserole to deglaze and remove all of the bits stuck to the bottom of the pan. Return the beef to the pan; stir to combine, add the remaining ingredients and bring to the boil. Cover the casserole with a lid and place in the oven. Cook for at least four hours or until the meat is very tender. The casserole should be quite wet, strain of a little of the excess gravy and reserve. Place the warm Boxty’s onto serving plates (in the cloth ear we use black cast iron pans as shown in the picture). Spoon some the braised beef and Guinness mixture onto one half of the Boxty and fold over the other side. Serve with a small ramekin of horseradish sauce and a jug of gravy on the side. Enjoy with a pint of the black stuff!!!!!!! !